Horace Lawson Hunley was born in Sumner County, Tennessee, on 29 December 1823. As an adult, he served in the Louisiana State Legislature, practiced law in New Orleans and was a generally notable figure in that area. In 1861, after the start of the American Civil War, Hunley joined James R. McClintock and Baxter Watson in building the submarine Pioneer, which was scuttled in 1862 to prevent its capture. The three men later constructed two submarines at Mobile, Alabama, the second of which was named H.L. Hunley. This vessel was taken to Charleston, South Carolina, in 1863, where it was to be used to attack blockading Union ships. During a test dive on 15 October 1863, with Hunley in charge, the submarine failed to surface. All on board, including Horace Lawson Hunley, lost their lives. On 17 February 1864, after it had been raised, refurbished and given a new crew, H.L. Hunley became the first submarine to successfully attack an enemy warship when she sank USS Housatonic off Charleston. 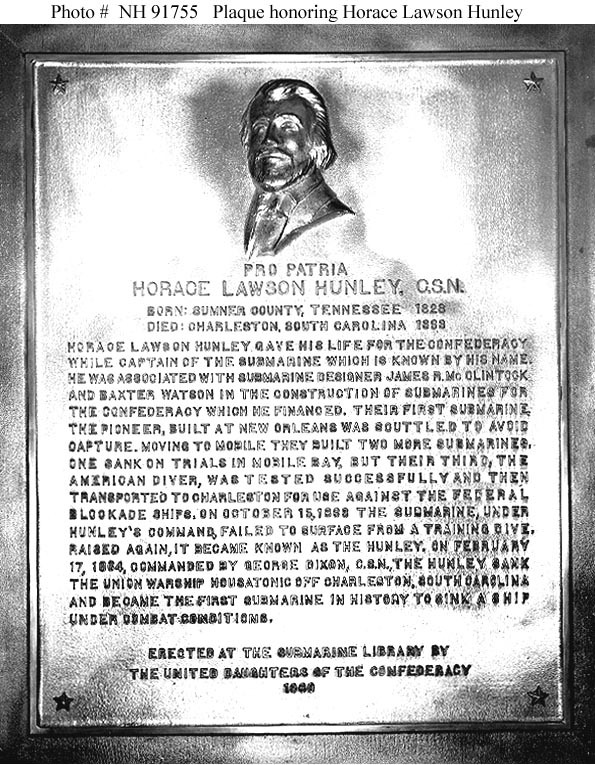 USS Hunley (AS-31) was named in honor of Horace Lawson Hunley. This page features an image of Horace Lawson Hunley and provides information about another. 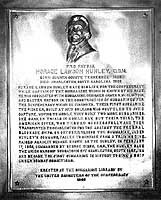 Plaque in his honor, erected at the Submarine Library, Groton, Connecticut, by the United Daughters of the Confederacy, 1960. He was one of the designers of the Confederate submarine H.L. Hunley (1863-1864) and lost his life in her on 15 October 1863. The 1828 birth date given on the plaque is incorrect. Courtesy of the Electric Boat Company, Groton, CT.
A head and shoulders photograph of Horace Lawson Hunley is owned by the Louisiana State Museum, PO Box 2448, New Orleans, LA 70178-2448. For additional information on this item, the availability of reproductions and usage rights, contact the Louisiana State Museum. That museum's WEB Site can be readily found through standard Internet search engines.